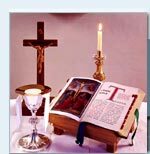 If you have any queries regarding the sacraments or wish to arrange a Baptism or Marriage, please speak to the Parish Priest after Mass on Sundays. Marriage Care offers a confidential counselling service and is committed to working with those whose relationships are in difficulty and breaking down. Advice is also available on Natural Family Planning. For appointments, ring 0800 389 3801. For information on the teaching of Natural Fertility Management, help for infertility, through the Life Fertility Programme, contact Margaret Neal. To contact the Association of Separated and Divorced Catholics, please phone 0208 767 5293. Worldwide Marriage Encounter is a movement within the Catholic Church to give married couples the opportunity to take responsibility for what is happening in their lives. A Marriage Encounter Weekend offers couples the opportunity to grow closer. It helps people to refocus on the values that are really important to them and to live more joyful and purposeful lives.